Editor: John H. Humphrey Postal address: The Editor, JRA, 95 Peleg Road, Portsmouth, Rhode Island 02871 U.S.A. 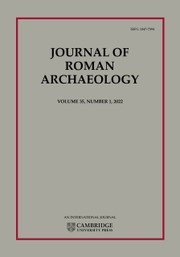 Hosted on behalf of Journal of Roman Archaeology L.L.C. The journal will be concerned with Italy and all parts of the Roman world from about 700 B.C. to about A.D. 700. It will exclude the prehistoric period but include the Etruscan period. It is intended to be Mediterranean-wide in its coverage, and is not intended to give priority to any particular geographical regions within the Roman world. All aspects of archaeology, by the broadest interpretation of that word, will be relevant for inclusion, including historical material which has an archaeological component or which is likely to be relevant for archaeologists.